Married Name: Her married name was Shannon. Marriage*: She married Thomas R. Shannon. Patricia Louise Shannon passed away peacefully at her home on May 17, 2018. Originally from Chicago, Patricia moved to Amelia Island with her husband, Thomas, where they enjoyed many years together before his death. She was also preceded in death by her brother, Jack (Carol) Purcell. Patricia lived a life of laughter and joy surrounded by a close circle of loving family and friends. She had a passion for music and the arts, excelling at playing the piano and spending hours painting. She was an avid golfer and tennis player and loved to travel the world and spend as much time as possible in nature. Patricia is survived by her sister, Jean (Fred) Skemp; her brother, Bill (Laverne) Purcell; her 4 daughters, Patty (Rob) LaBarge, Moira (Jim) Minta, Rosemarie (Jeff) Knoll, Peggy (Tony) Albachiara; 8 grandchildren, Joey (Megan) Minta, Tommy (Lauren) Minta, Molly (Matt) Ireton, Tim (Sarah) LaBarge, Colleen (Patrick) Mac Carthaigh, Anne Marie Albachiara, Kristine Albachiara, Nicole Albachiara; and 3 great grandchildren, Ryan LaBarge, Everett Minta, Hannah Ireton. In lieu of flowers, memorial gifts can be made to Community Hospice and Palliative Care, www.communityhospice.com or the Amelia Arts Association. Arrangement made by Corey-Kerlin Funeral Home. [S1978] Ancestry.com Family Trees, online www.ancestry.com, My Family Tree, Anne Walsh; Patricia Purcell Shannon page. Accessed March 13, 2019. [S2770] Florida Times-Union, May 22, 2018, Online at: https://www.legacy.com/obituaries/timesunion/obituary.aspx, Accessed on line March 13, 2019. [S2771] Legacy.com, online Legacy.com, Patricia Louise Shannon, Jacksonville. Florida. Accessed March 1, 2019. Death*: He died on 6 December 1904 at 348 E. Indiana, Chicago, Cook County, Illinois, USA; Quinn, Daniel. Beloved husband of Margaret Quinn (nee Madigan), father of Tessie and Margaret Quinn, brother of Patrick Quinn. Funeral Friday, at 9 a.m. from late residence 348 E. Indiana St., to Holy Name Church where high mass will be celebrated, thence by carriages to Calvary. [S561] 1880 US Census, Illinois, Cook County, Chicago, Washington, DC, ED 48; Page 224, Ancestry.com. [S559] Quinn - Madigan Marriage License. [S593] Daniel Quinn, Illinois death certificate, Family History Library, MF# 1239710. [S560] June 7, 1900 US Census, Illinois, Cook County, Chicago, Washington, DC, ED 127, Page 13A, Ward 5, Ancestry.com. [S561] 1880 US Census, Illinois, Cook County, Chicago, Washington, DC, ED 48; Page 224. [S1453] The Daily Inter Ocean, November 2 1888, Page 8, column F, www.galegroup.com, accessed January 30, 2012. [S614] Chicago Daily News, December 7, 1904, p. 16. [S2016] Jacob Glenius to Tessie Quinn, Marriage License, February 21, 1914: Indiana, Marriages, 1780-1992; citing reference app 33, 34; FHL microfilm 1,871,256; accessed February 5, 2015. [S1207] Chicago Daily News, December 20, 1910, page 18. [S1208] Chicago Daily News, November 12, 1918, page 32. [S1210] Margaret Agnes Quinn, Illinois Standard Certificate of Death, Family History Library, Salt Lake City, Utah, MF#1892487. [S1212] Chicago Daily News, February 18, 1930, page 38. Death*: He died on 1 November 1888 at Chicago, Cook, Illinois, USA. Quinn -- Nov 1, Patsy, beloved and only son of Dan and Margaret Quinn (nee Madigan), aged 4 years and 9 months. Funeral from parents' residence, No. 2851 Emerald avenue tomorrow, at 11 o'clock, by carriages to Calvary. 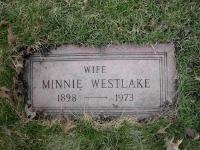 [S1123] Tessie Gelenius, Illinois Certificate of Death, Family History Library MF#1892228. [S1038] Chicago Tribune, November 23, 1955, 14. [S1059] Minnie Westlake Grave marker, Ridgewood Cemetery, Des Plaines, Illinois. [S1070] William Westlake, Illinois Medical Certificate of Death.